Power yoga is a general term used to describe a vigorous, fitness-based approach to vinyasa-style yoga. It is closely modeled on the Ashtanga style of practice. Unlike Ashtanga, power yoga does not follow a set series of poses. What they have in common is an emphasis on strength and flexibility. Power yoga will appeal to people who enjoy exercising with a minimal amount of chanting and meditation with their yoga. 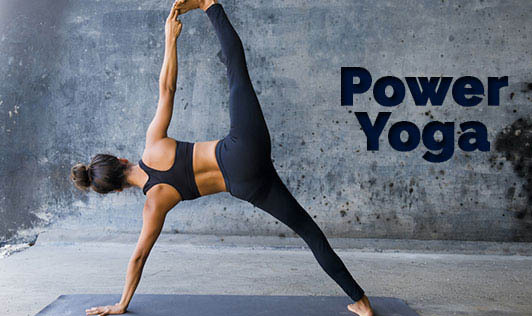 Power Yoga stresses upon the right form of doing asanas and retaining them for longer time, which helps to improve upon the endurance and flexibility of the body. Power Yoga is done through a sequence of Yoga Poses. At the same time you synchronize your breathing patterns to every move, or Vinyasa. This results in movements that have perfect unity and grace. It is a dynamic and energetic exercise. It consists of pushing and contorting each and every limb to the ultimate limit. At the same time you are maintaining a strong sense of inner peace and trying to pull off every move flawlessly and gracefully. The poses done in Power Yoga are associated with the backbone of Surya Namaskar. A lot of sports enthusiasts take up Power Yoga because of its ability to balance opposing muscle groups. This lets ease a number of sports pains and injuries. Power yoga acts upon the different joints, by improving lubrication of the joints, ligaments and tendons. Not surprisingly studies have shown that the body - which is otherwise rather rigid - begins to experience an incredible flexibility, even in the parts that weren't consciously worked on. Power yoga works wholesomely upon the different body parts. This organic stimulus in turn helps us by warding off disease and giving a premonition at the first possible sign of a probable arrival of disease or disorder. There are different kinds of power yoga like the core power yoga, progressive power yoga, prana power yoga, brain power yoga and so on. It can also be practiced by kids and pregnant women under the supervision of a certified yoga trainer.